To value freedom, it is important to learn about the past. The aim of the museum is to tell touching stories about Estonia’s recent history that make people think about the value and fragility of freedom. Vabamu Museum of Occupations and Freedom and its branch KGB Prison Cells are the largest active non-profit museum in Estonia. The museum is managed by the Kistler-Ritso Estonian Foundation. The Vabamu Museum of Occupations and Freedom is a place that recounts the story of the Estonian people from occupation to independence and inspires people to maintain and stand up for their freedom. We educate, engage, and encourage Estonian people and visitors to reflect on recent history, feel the fragile nature of freedom, and stand up for liberty and justice. Values form our shared mental space, which we follow and believe in. Our recent history holds a vast amount of knowledge and experience. Remembering, understanding and cherishing the past allows us to shape a better future, both today and tomorrow. As an institution of collective memory, we connect the threats and opportunities of the changing world with a belief in people’s inherent good will, so as to avoid any repetition of the past occupations. We tell the stories of Estonian people, allowing visitors to experience the joy and sorrow of humankind. We offer an opportunity for anyone to self-reflect and recognize what is significant, also inviting visitors to take responsibility in creating a new positive chapter in the story of individual and national freedom. We initiate discussions to bring together people of all nationalities and their ideas. We are open to different perspectives and create opportunities for people to exchange their opinions. Our task is to engage and listen to people, wishing to involve their feedback and viewpoints. We unite friends, visitors and Estonian society to encourage them to carry on the ideals of liberty. We are curious and eager to participate in discussing the important questions affecting the society. We stand for the freedom of expression, opinion, religion, mobility, print, enterprise, and all the other forms of freedoms. We remember how these freedoms have been repressed in the past, and ensure that they are rebuilt and reimagined in the present. In 1998, the Kistler-Ritso Estonian Foundation and the organisation of the same name in the United States were founded simultaneously to contribute to the research and remembrance of Estonia’s complex recent history. The mission of the Kistler-Ritso Estonian Foundation was to create a museum in Tallinn reflecting Estonia’s recent history. The museum, founded on donations by Olga Kistler-Ritso, was opened to visitors on July 1, 2003. Since the opening of the museum, the Ministry of Culture has consistently supported its activity. 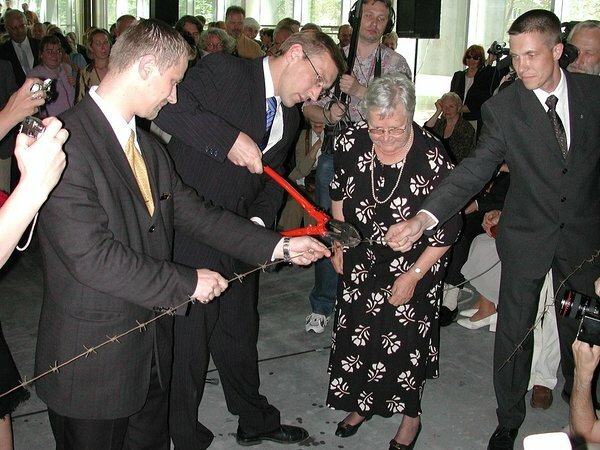 The opening of the museum in 2003. The name of the foundation is derived from the fact that the foundation of the museum is strongly linked to the mission of one brave woman. The biography of Olga Kistler-Ritso reflects how the systematic evil of the occupying powers failed to break the spirit of the people. Olga Kistler-Ritso was born on 26 June 1920 in Ukraine. Her Russian mother died at a young age and Eduard, her Estonian father, was sent to a Siberian prison camp for years by the Bolsheviks. Along with her brother Aadu, Olga, who was only a few years old, had to take on the journey as a refugee – with the help of their uncle, the children managed to reach their father’s home. The uncle decided to give Olga to a foster family to provide his niece with a stable family life. Olga was adopted by the Olliku family. Olga and the Olliku family. 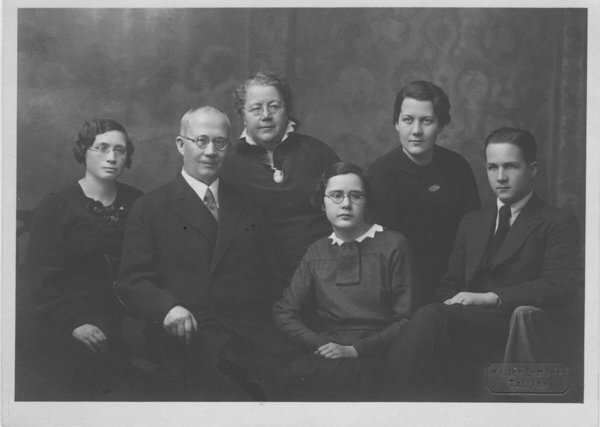 Following in her father’s footsteps, Olga went to study at the Faculty of Medicine of the University of Tartu and graduated in 1944. In the autumn of the same year, fearing the recurrence of the Soviet terror, she fled along with 80,000 other Estonians. Having found temporary refuge in a German refugee camp, she worked as an ophthalmologist and a paediatrician. In 1949, Olga migrated to the United States, where, as a result of her strong determination, she managed to start an eye surgery practice. Dr Olga Kistler-Ritso was a recognised specialist in her field. Olga kept herself well informed about the developments in Estonia. In 1976, she returned to Estonia to visit her country and relatives for the first time after her departure. 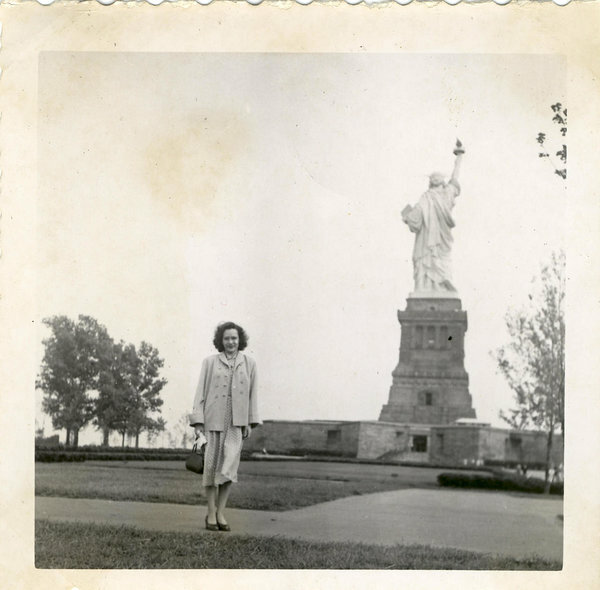 Olga in the United States with the Statue of Liberty. Olga wanted to contribute something big to Estonia, something that would inspire future generations to appreciate their history, and thus, almost half a century after fleeing from her homeland, she donated nearly three million euros for the development of her country and for the creation of the museum. Olga’s dream was that the crimes committed in Estonia’s recent history would never be repeated. During its 15 years of operation, the museum has hosted close to a million visitors, opened nearly a hundred temporary exhibitions and issued dozens of stipends. The museum keeps a close cooperation with many embassies, state agencies, non-governmental organisations, and other partners operating in Estonia. Together, we have organised exhibitions, conferences, seminars, discussions, and film programmes focusing on recent history. The museum collection contains nearly 40,000 items, photographs, letters, and documents. The collection and storage of museum items began already in 1999. Over the years, thousands have shared their stories with and donated valuable items to the museum. The collections have received rare notebooks and letters written on Siberian birch bark, items made in the Gulag, which, at the time, provided a ray of hope in the midst of the darkness of camp life. We also have fragments on the activities of the resistance movement and many more illustrative items from Estonia’s recent past. The museum building is the first ever Estonian building erected specifically to house a museum. A small birch grove, which commemorates those lost to the crimes of the occupation, leads to the museum. The walls of the building are made of glass to provide visitors with a sense of freedom and transparency, so scarce during the occupation era. As architects Siiri Vallner and Indrek Peil have said, ‘The architecture deliberately avoids centre points and symbols. The fragile feel of the museum forms a conscious contrast with the means of expression of recent history.’ Read about the architects’ vision for the museum building here. In 2018, the construction of a new permanent exhibition was undertaken at the museum. The new permanent exhibition focuses on the occupations, resistance, recovery, and freedom.